Mother Mercy arrived one hour late. Her car stopped on the sandy Senegalese backstreet right outside the doorway; she stepped out of the passenger seat and strode into the bare, ramshackle locales of her collective for women who had lost their sons to boat migration. A crisp black dress laced with silvery strands flowed around her as she sashayed past, talking loudly into her mobile; on her wrist glittered a large watch. "Ah, excusez-moi," she said, switching from Wolof on the phone to French, momentarily addressing me as I waited behind a wooden table in the corner. "The traffic jams . . ." She sat down and snapped her fingers to command the attention of her assistant, a rotund woman behind a rickety counter at the back of the room. The assistant promptly brought her calendar, whose pages already spoke of visits to France, Italy, and Spain: Mother Mercy was a busy, busy woman. She flipped through the pages with one hand as she clutched her mobile with the other, giving orders and managing appointments in an executive stream of Wolof and French while jotting down the details of another trip abroad. It was at this point that I realized something strange was happening in the world of clandestine migration. Eventually Mother Mercy hung up and slid a brochure across the table. "Our collective started its work with our sons losing their lives." She had switched to a soft, maternal voice that sounded as though it had been through hundreds of rehearsals. As it turned out, this was indeed the case. Her outfit had been fêted by journalists and politicians from London to Las Palmas since the fateful days of 2006, when fishing boats packed with migrants had departed from Senegal for the faraway Canary Islands. "Mother Mercy," which the media soon insisted on calling her because of her brave "battle against migration," had graced the screens and pages of the BBC and France2, Glamour and Elle magazines, the Washington Post, France's Libération and Le Monde, Spain's El País . . . the list was endless. She flicked through the brochure detailing the collective's good works, temporarily ignoring the incessant ring of her mobile. "Our campaigns have put a stop to illegal migration," she said, despite the "meager means" at their disposal. "We have to work hard to fixer les jeunes (keep the youth in place)." The media and politicians had praised her efforts to keep the youth in place through so-called sensibilisation (sensitization), awareness-raising campaigns about the "risks of illegal migration." Her work was "more effective than all the warships and planes sent to the Atlantic Ocean by the European Union," the BBC had said in 2006. If so, Mother Mercy was a victim of her own success. By 2010, the boats had stopped departing, and funding was slowly leeching away. "We have to continue our work," she said. "If we do sensitization here, people just depart from elsewhere," which meant they had to spread the message across the whole country, even over the whole region! "La sensibilisation n'a pas de deadline," she said distractedly while typing a number into her mobile, then calling. My brief audience was over. I went outside and called Mohammadou. "Tell him you got the number from me," Mother Mercy had said, scribbling it on a piece of paper. Soon enough Mohammadou came ambling towards the office. He was the president of the local association of young repatriates from Spain but cut a poor figure for such a lofty title in his loose jeans, plastic sandals, and old jacket, a cap resting on his head. He said a brief, unsmiling hello and then led me into the sand-swept lanes of his neighborhood. Yongor, as I will call it, was a fishing village swallowed by the urban sprawl of Dakar that had been particularly hard hit by boat migration. It was from here that Mohammadou and his friends had once set off, and it was here that they now lingered, jobless and immobile, nursing the wound of their one-time deportation. "What can you offer us?" Mohammadou blurted out as we walked towards the beach, the stale air carrying smells of putrid fish and gasoline. "And what do you want?" The order of his questions seemed topsy-turvy, but it was so for a reason: he had seen too many visitors already. On a corner, two women in bright robes squatted next to a cart piled high with mangoes, children scuttling round them in the pale, hot sand. Walking past, I tried to think of suitable replies but had none to offer him. At the family home of Ali, a brawny repatriate in his twenties, the crash of the waves whispered through narrow lanes whose walls were scrawled with the phone numbers of neighbors' relatives in Spain and France. Ali wedged a wooden bench into the sand, and Mohammadou sat down and got his notebook out. He flicked through page after page of names, numbers, and e-mails of all those who had come to see his repatriates' association. The contact details of journalists, researchers, students, NGO workers, even an E.U. delegate adorned the pages. He had never heard back from any of them. "A lot of people have passed by here, but every time they go back to Europe, there's nothing." Ali nodded and shared out his only cigarette, Mohammadou drawing the last bit of smoke from its dying embers. "Ils mangent sur nous" (they eat from us), Mohammadou said, his mouth twisting into what would soon become a familiar frown. Even the aid organizations ate their money, while the repatriates got nothing. "I am the president, and I have to ask him for a cigarette. Do you think this is normal?" Mohammadou said angrily, nodding towards his friend. The repatriates had had enough. They did not want to speak to researchers or reporters any longer. They felt embittered and angry with the fact finders and delegations-not to mention with the interlocutor of these toubabs, or white people, in Yongor, Mother Mercy. "Why did she send you to us?" Mohammadou asked with a twisted smile. It was a rhetorical question that was to become a standing joke during the coming year. "Because you don't bring any money. If you had come in a four-wheel drive, she would have invited you to her house." The wave of clandestine migration hit the shores of Senegal and the front pages of European newspapers in the summer of 2006. The sudden sight of brashly painted wooden boats groaning under the weight of disheveled Africans had come as a shock and surprise to the news-reading public and Spanish police alike, but the signs and premonitions had been there. The previous year, sub-Saharan migrants stuck in Morocco had launched the infamous mass attempt to climb the fences surrounding Ceuta and Melilla. The ensuing crackdown pushed clandestine routes southwards: first to Morocco-occupied Western Sahara, then to the desert state of Mauritania along the Atlantic coast, and finally farther south to Senegal and beyond. A direct route had suddenly opened up from West Africa to Europe, and youth from Senegal and farther afield saw their chance to hitch a ride. In 2006 almost thirty-two thousand people landed in the Canary Islands, fifteen hundredkilometers of rough Atlantic to the northwest of Dakar. Boats had landed in earlier years in the archipelago's smaller easterly islands, often carrying Sahrawis and Moroccans, but it was with the West African arrivals in Tenerife and Gran Canaria that an extraordinary spectacle unfolded. Tourists in swimsuits rushed to assist exhausted migrants on the beaches, and soon the media "set up a show" in port, as one local migration scholar recalled. A moral panic over the human "tsunami" or "avalanche" washing over the islands was reinforced with each day's fresh tally. 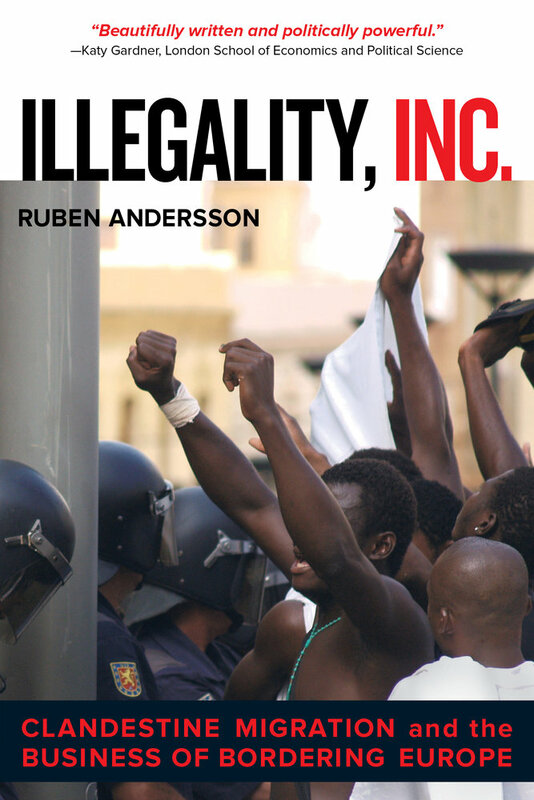 Never mind that in 2006, amid the clamor over that year's thirty-two thousand boat arrivals, about ten million travelers passed through just Gran Canaria's airport, including large numbers of labor migrants from Europe and Latin America: the storyline about irregular migration was set and framed through racial images of an unstoppable invasion. The media hysteria also reached West Africa, where newscasts showed how a new route had suddenly opened to Spain-and was soon to close down with the deployment of European sea patrols. It was now or never. "This is the big chance, we mustn't lose it," young men reasoned in Senegal's seaside fishing hamlets, according to Ousmane, a theater producer and community leader. "It was generalized madness." Women scrambled their savings together to finance the trip; young men bartered their family belongings. The captains of the boats became sudden heroes, and women sang their praise. Everyone wanted to leave on mbëkë mi, the Wolof term for the journey that literally means "hitting one's head." "At that time, everyone talked of the forecast," Ousmane recalled: people checked obsessively for the best weather conditions in which to depart. Rumors were spreading. Spain wanted more migrants to come and work! The expressway to Europe was open! Fishermen-turned-smugglers loaded their large wooden canoes with cans of petrol, bottles of water, and supplies of dry food. They consulted the marabouts (Muslim religious leaders), collected the money for the "tickets," set their GPS for Tenerife, and off they went, boatload after boatload of willing workers. Barça walla barzakh was their motto:"Barcelona or the afterlife." Men who hesitated to join in the boat craze were ridiculed as effeminate and weak of will. People said "Jéleen gaal yi, jigeen yi jél avion yi!" Ousmane reminisced: take the boat, [only] women take the plane! After the mania came the fall. Police detained and imprisoned those who had been forced to return while the death count added up at high sea. Relatives' phone calls were left unanswered. Boats disappeared with their human cargo, never to be heard of again. Thousands died in the waves; no one knows exactly how many. Mohammadou's fishing village was a pioneering terrain for mbëkë mi, and its youth suffered worse knocks than those of other coastal communities. While some local convoyeurs (smugglers) and maraboutshad made good money out of the boat craze, losses were adding up across the neighborhood. Wives, children, and parents were left bereaved and often bereft of income. Walking along the lanes of Yongor, Mohammadou invoked the dead at every turn. "Do you see her?" he said as we passed a woman in her thirties carrying a bucketful of goods on her head. "She lost her husband, she lost five family members, that's why she has to work now." He nodded towards friends, saying, "He was in my boat" or "In his house three people died." He had tried counting the dead, but his mother had told him to stop when he reached 475-the effort was ripping open barely healed wounds. "Everyone has lost someone here." If the boat arrivals in the Canaries had triggered the first media frenzy, the tragedy back in Senegal now set off another. Journalists descended on the country's seaside communities in search of stories on the dead, the missing and the deported-and Yongor was at the center of their attentions. A 2006 visit to the neighborhood by the French presidential hopeful Ségolène Royal spurred the reporters on and put Mother Mercy and her association in the spotlight. Yongor went "from dire anonymity to world fame," as one news report put it: it was becoming a privileged stage for what the Spanish media and politicians liked to call the "drama of immigration." By 2010, the wave of clandestine migration had receded. But in its wake a confrontation had spread across Yongor and beyond, pitting mothers against sons and former migrants against one another. I had come there looking for stories about the fraught sea journeys and the brief, extraordinary arrival of Senegalese fishing boats at the heart of Western leisure migration, the playas of Tenerife and Gran Canaria. So had hundreds of other researchers and journalists. The repatriates' tragedies had been told and retold to countless visitors, but their resentment about this retelling opened a new line of inquiry. As I left Ali and Mohammadou on their bench, I was already intrigued by their simple, recurrent question: who benefits from illegal migration, and how? Mohammadou and his repatriated friends would in the coming year help me analyze who the winners and losers were in the illegality industry at Europe's southern frontier. This industry, built around the fight against illegal migration and drawing in the media, defense contractors, civil society, politicians, academics, and police, has-among other achievements-put the unemployed repatriates to work. The repatriates deter any "potential candidates for illegal migration" from even trying the journey; they bring in money for local associations, NGOs, and politicians; and they provide compelling stories for journalists and academics alike. But it is not enough to consider how, in Mohammadou's words, everyone "ate" from migration. His question about illicit gains led to other, deeper quandaries. Why this fascination with the unfortunate travelers of the high seas? And why, despite this fascination among aid workers, journalists, and politicians, were they sidestepped as the illegality industry rolled into Dakar and other West African departure points from 2006? Beyond its much-vaunted "success" in fighting migration, what social realities did this industry leave behind in Senegal's seaside neighborhoods?During my visits to Yongor in 2010 and 2011 that structure this chapter, I would try to find answers to these questions. Mohammadou often picked me up at the highway roaring out of Dakar as I came back after my fieldwork excursions along migrant routes through Morocco, Mali, and Spain. A Ford billboard towered over the fume-choked junction: "Drive one," it exhorted, next to a picture of a slick four-wheel drive. If such a car ever slogged up the sand-whipped lanes of Yongor it was bound to belong to either a local dignitary, an expatriate in Dakar's booming aid industry, or a modou-modou, the Wolof term for rags-to-riches emigrants who in recent decades have come to embody success in Senegal. On our walks of Yongor, we sometimes met modou-modou back on visits from Europe, big-boned and well-fed men sporting new jeans and confident smiles. Their houses, built with remittances from Spain, Italy, or France, reminded the repatriates of their failed journeys at every turn. If the modou-modouadvertised the benefits of departure, the repatriates were their abject inverse: walking billboards testifying to the futility of boat migration. Failure was broadcasted by their sullen faces, their empty pockets, their shattered dreams. They had used up their savings to pay up to five hundred thousand CFA (one thousand dollars) for a journey in a packed boat only to be intercepted, detained, and sent back from detention centers such as the one I had visited in the Canaries. Their friends had died in the rough seas. Some had turned back before reaching the archipelago; others, like Mohammadou, had been diverted to Western Sahara, where internment and expulsion to the Mauritanian border awaited. Mohammadou told me how he had spent days walking back and forth in the desert no-man's-land between Moroccan and Mauritanian border posts, soldiers forcing the migrants to retreat at gunpoint, until Senegal's president intervened. Eventually Mohammadou made it back home, penniless. The migrants' dreams had swiftly turned into the stuff of nightmares. The shame of return was shattering. Sometimes tricked onto their deportation flights by police who told them they were being sent to mainland Spain, sometimes promised a money envelope that ended up containing as little as ten thousand CFA, the repatriates eventually made it home. Some slept on beaches or hid with acquaintances, too ashamed to face their families. Their shame was not just a family disaster, however. It was also a dissuasive weapon, as I would learn in the Spanish embassy, a world away from Yongor and its miseries. The embassy, a whitewashed edifice in central Dakar's Plateau District, was an operation in constant expansion. As the migrant boats kept coming in 2005 and 2006, Spain suddenly "discovered" sub-Saharan Africa. The country's Socialist government embarked on a political offensive in West Africa and opened new embassies across the region. Under its first Africa Plan, launched amid the growing boat crisis in the Canaries, Madrid also doubled overseas development aid to sub-Saharan Africa between 2006 and 2010. The Dakar expansion was part of this. In the years following the visits of ministers and the Spanish premier in 2006, a new consulate had been built, an export promotion office had opened, and Interior and Labor Ministry attachés had set up shop. Ruben Andersson is Associate Professor at the Department of International Development at the University of Oxford. Visit http://rubenandersson.com/ for more information. "[An] impressive work of outstanding scholarship . . . highly recommended . . . a brilliant ethnography."